Orpingtons are an attractive hen whose gentle, quiet, child friendly nature make them a great addition to your lifestyle block. They are a heavy, dual purpose breed who are good layers, with pullets producing around 300 eggs in their first season. Originating from Great Britain the breed has a number of colours with black, blue and buff being the most popular. 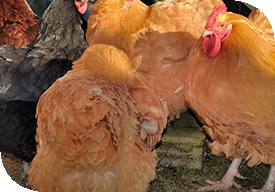 To get started buy 'point of lay' pullets (less than a year old and yet to lay eggs) in the spring or summer. As they are a bigger breed of hen Orpingtons require plenty of room as well as fencing around 900 millimetres high. These hens suit being kept as free range or in a run. A hen will lay for approximately 6 to 8 months between years one and two. After that, an Orpington will lay for 10 months a year. Eggs will be medium sized and light brown. Not all varieties of Orpingtons are equal when it comes to laying. The black, blue and splash are the best in New Zealand with the buff producing the least eggs. Feed usually consists of chicken pellets, sprouted grains and water. For their health and wellbeing ensure space for a dust bath (helps prevent issues such as mites). These hens will get broody at around spring or summer time when the weather warms up and are considered good mothers. Vanessa Mitchell, mother of three, lives on the beautiful Banks Peninsula with her husband Shaun operating the Twisted Ngayon bed and breakfast (www.twistedngaio.co.nz). They share the property with two jersey cows, two donkeys, Cayuga ducks and Orpington chickens.